John Yoo is a law professor at the University of California at Berkeley Law School (Boalt Hall). He is most famous for his work from 2001- 2003 as a deputy assistant attorney general in the Office of Legal Counsel of the U.S. Department of Justice where he worked on providing the justification for torture of U.S. held prisoners at Guantanamo Bay and in Iraq. Some of Boalt Hall’s law students do not particularly like having him associated with their school. In an article entitled "Berkeley Law School Students Protest Professor's Work For Bush Administration," in the May 22, 2004 edition of Talk Left: The Politics of Crime the author noted that a legal memo written by law professor John Yoo for the Bush Administration, "contributed directly to the reprehensible violation of human rights in Iraq and elsewhere," according to a petition being circulated among students and faculty at Berkeley's Boalt School of Law. "The Jan. 9, 2002, memo co-written by Yoo ... argued that the normal laws of armed conflict didn't apply to al-Qaida and Taliban militia prisoners because they didn't belong to a state." As a result, according to Yoo and "Torture Boy" Gonzales, suspected al-Qaida and Taliban militia prisoners were not entitled to protection under the Geneva Convention or Congressional legislation that explicitly outlaws torture and makes it a crime to engage in torture. For years now, we at Bring It On have wondered "Who is John Yoo?" Does his early childhood provide "any hints" of his sadistic nature or his anti-civil liberty leanings? Of course, attempts to find out about his early childhood have turned up empty as his biographical sketches usually start with the facts realated to his clerkship for that champion of civil liberties Justice "Coke Can" Thomas at the Supreme Court. So we call on, you! We strongly urge friends, neighbors and Boalt Hall students of Dr. Yoo to "go public" with any known details of Dr. Yoo’s background that may solve these mysteries. While we know that Dr. Yoo is a member of the secret federalist society, we do not know much else. Is it possible that Dr. Yoo is a member of the ultra-secret "National Association of Waterboarders" or "NAW" which purportedly practices "waterboarding" for recreation and sport. We just do not know and cannot say if the organization even exists, but someone claiming to be a high-ranking "NAW" official contacted us and was willing to speak to Bring It On . Of course, given the highly dangerous nature of "waterboarding" which can result in death, our source refused to disclose either his whereabouts, true name, or whether NAW is active. For the purposes of our highly confidential interview he asked us to refer to him as "Mr. Last Gasp." Bring It On's Exclusive Interview With Purported NAW Official Mr. Last Gasp! Bring It On : What exactly is Waterboarding? 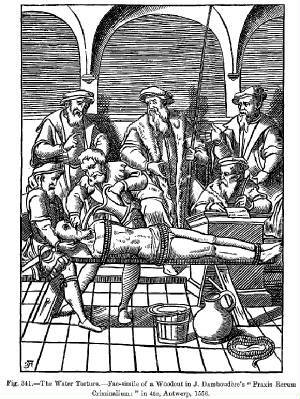 Mr. Last Gasp: Waterboarding is a medieval torture device. In medieval times, the victim was strapped to a board and tipped back or lowered into a body of water until he or she believed that drowning was imminent. The subject was then removed from the water and revived. If necessary the process was repeated. (see graphic above left). Bring It On : Wasn’t Waterboarding also used against suspected witches? Mr. Last Gasp: I can see you’ve done your homework. 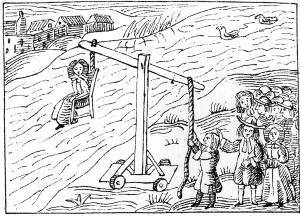 Yes, women suspected of being witches were subjected to a form of waterboarding know as dunking. The suspected witch was tied to a seat held over a body of water. Using pulleys and levers, the suspected witch was gradually lowered into the water. After being immersed for some time, the victim was revived and given the opportunity to confess. If she confessed, she was killed by burning or hanging. If she did not confess, she was submerged again until the victim drowned or confessed. (see grahic at right). Bring It On : What is the common element of "waterboarding" interrogation techniques? Mr. Last Gasp: The technique is designed to make someone drown. The trick is to revive them prior to death. The psychological effect is obvious. The victim is led to believe that he or she is being executed. This reinforces the interrogator's control and makes the victim experience mortal fear. The physical effects are extreme pain and permanent damage to the lungs, brain damage caused by oxygen deprivation and sometimes broken bones because of the restraints placed on the victim. At NAW, our subjects are consensual so usually we experience little in the way of broken bones. Bring It On : What do you know about current CIA methods of waterboarding? Mr. Last Gasp: Brian Ross and Richard Esposito described the CIA's "waterboarding" technique in an article posted on the ABC News web site on Nov. 18, 2005. According to the article, "The prisoner is bound to an inclined board, feet raised and head slightly below the feet. Cellophane is wrapped over the prisoner's face and water is poured over him. Unavoidably, the gag reflex kicks in and a terrifying fear of drowning leads to almost instant pleas to bring the treatment to a halt. According to the sources, CIA officers who subjected themselves to the water boarding technique lasted an average of 14 seconds before caving in. They said al Qaeda's toughest prisoner, Khalid Sheik Mohammed, won the admiration of interrogators when he was able to last between two and two-and-a-half minutes before begging to confess." Bring It On : Is "waterboarding" torture? Mr. Last Gasp: To me, no, but not everyone agrees. John Sifton of the of Human Rights Watch has said that, it is in essence "a mock execution," which is illegal under international law." We at NAW, however, look at more like an ancient "performance art" ritual practiced between consenting adults that relieves the stress of modern living. While it is sort of edgy and trendy right now, we pride ourselves on developing and adapting its techniques through the use of more modern and sanitary materials (cellophane has replaced the cloth) and making "waterboarding" an exciting art form that millions of everyday Americans can enjoy. Our "new member programs" are designed to train the novice in the safe practice of the technique. Once a "novice" conducts 10 successful waterboardings (those that do not result in death) they can become certified full-fledged members of NAW know as "high priests." Mr. Last Gasp: We also support a "best practices" manual for the avid "waterboarder." We also enforce "a continuing membership requirement." Any NAW member reported to have conducted more than three "failed waterboardings" that result in the death of the subject in any two-year period must appear before the NAW Internal Affairs Committee or "NAWIAC" which determines whether or not a high priest can retain their title or in extreme cases their NAW membership! While we expressly deny that any US Intelligence officer or agent of the government is a member of NAW, we have a "national security" exception to this provision. Bring It On : Other than sponsoring "safe houses" for "waterboarding" enthusiast, I understand that NAW engages in charitable giving as well. Mr. Last Gasp: I am glad you brought that up. For the last ten years NAW has sponsored local "NAW - Offs" to raise money for evangelical churches that support erecting ten commandment statutes in public spaces. It is very rewarding. Bring It On : Do you know whether any government agencies have contacted NAW to recruit members as private contrators to interrogate prisoners around the world? Mr. Last Gasp: I am not at liberty to discuss that issue, but I will say that there has been a "revival" of interest in waterboarding in the United States in the last several years.